A number of variable affects the learning achievement but this research is interested in discovering the effect of instructional methods and independent learning towards the learning achievement in social science. The research aims at discovering the mentioned effect in Social Science at SDN Pluit 05 Pagi, Penjaringan Subdistrict, North Jakarta. 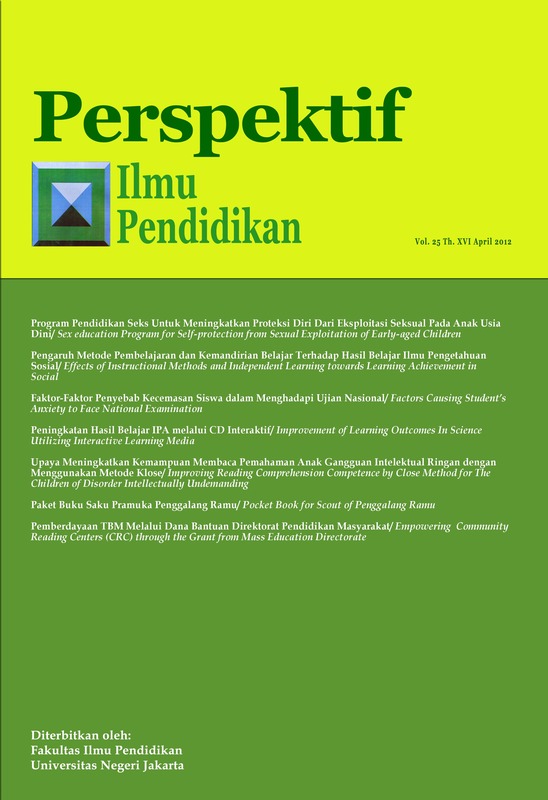 The research discovered (a) the learning achivement with role playing method is higher compared to expository method, (b) students with high independent learning style has higher learning achievement compared to those having a lower one, (c) learning achievement of the students with high independent learning taught with role playing instruction is higher than those with low independent learning, and (d) learning achievement of the students with low independent learning taught with expository method is lower than those having high independent learning. Based on the findings, the research suggests the teachers to improve their skills in teaching social science and assist the students to learn based on their individual learning styles.